University of Oklahoma Press, 9780806131467, 672pp. 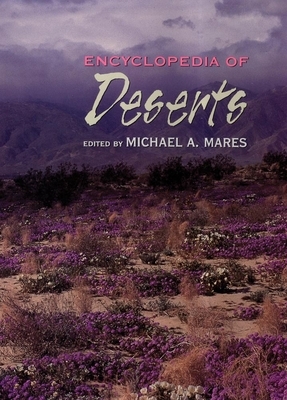 Encyclopedia of Deserts represents a milestone: it is the first comprehensive reference to the first comprehensive reference to deserts and semideserts of the world. Approximately seven hundred entries treat subjects ranging from desert survival to the way deserts are formed. Topics include biology (birds, mammals, reptiles, amphibians, fishes, invertebrates, plants, bacteria, physiology, evolution), geography, climatology, geology, hydrology, anthropology, and history. The thirty-seven contributors, including volume editor Michael A. Mares, have had extensive careers in deserts research, encompassing all of the world's arid and semiarid regions. The Encyclopedia opens with a subject list by topic, an organizational guide that helps the reader grasp interrelationships and complexities in desert systems. Each entry concludes with cross-references to other entries in the volume, inviting the reader to embark on a personal expedition into fascinating, previously unknown terrain. In addition a list of important readings facilitates in-depth study of each topic. An exhaustive index permits quick access to places, topics, and taxonomic listings of all plants and animals discussed. More than one hundred photographs, drawings, and maps enhance our appreciation of the remarkable life, landforms, history, and challenges of the world's arid land.